Sonic Mania Collector's Edition will be coming to Europe and is available to pre order now! Following the announcement of the Sonic Mania collector’s edition in North America, SEGA is delighted to announce that it is coming to Europe, and is available to pre-order exclusively through Amazon in the UK, France, Germany and Spain. The physical collector’s edition of the Sonic Mania is chock-full of 90s nostalgia. 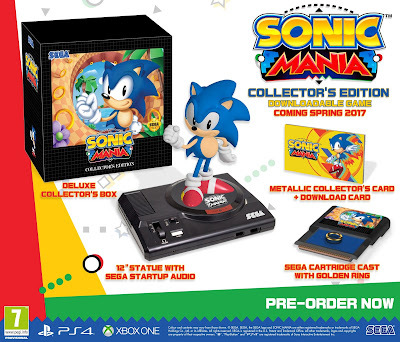 The Collector’s Edition will include, amongst other notable items, a 12-inch Sonic statue adorning a replicated (non-working) SEGA Mega Drive console that plays the famous SEGA startup audio when the power switch is flipped, SEGA cartridge cast with a gold ring inside and a metallic collector’s card with a download code for the actual digital game. The standard Sonic Mania edition pre-order will come at a later date. Both editions will include a digital code for the game launching in Spring 2017.